Another Eid-ul-Fitr is bulldozing its way through the month of Ramadan. Up until the recent past, say five, maybe six decades back, Ramadan was observed with quiet self-reflection, prayer, sharing and abstinence. Eid was a celebration of togetherness, family, generosity and love. Afifa Begum, who is now nearly 80, remembers looking forward to Eid with excitement and a hint of impatience. “My parents always bought one set of new clothes for me and my nine siblings. When they couldn't afford to buy us clothes, they gave us small gifts, like hair ribbons, socks, plastic toys, but there was always something new for each of us. We looked forward to these little gifts and good food on Eid day,” she reminisces. “Eid was never about gifts in our home,” says Mashida Ali, who is about to celebrate her forty something Eid. “ We always had large family get togethers and relatives we wouldn't be able to see for months would be there and that was always the main attraction,” she remembers. All that seems to be in the past though. Eid has been evolving slowly, right under our noses and we, the once altruistic and devout, use Eid as an excuse to become full-fledged shopaholics. Blame it on economic prosperity, globalisation, changes in living standards-whatever floats your boat, but the fact remains that many people no longer think of Ramadan as a holy month of abstinence, instead, it has turned into a month of unrestrained self indulgence. People are no longer buying only for their immediate families and the needy-they seem to be making purchases for every single person they know and their neighbours too. “This Eid, I have to buy new clothes for my parents, my husband, my three children, my sisters, their families, some uncles and aunts and I won't even get started on the number of in-laws I have to shop for,” says Mashida Ali, “Oh and I almost forgot, I need to get things for the house help too,” she adds. 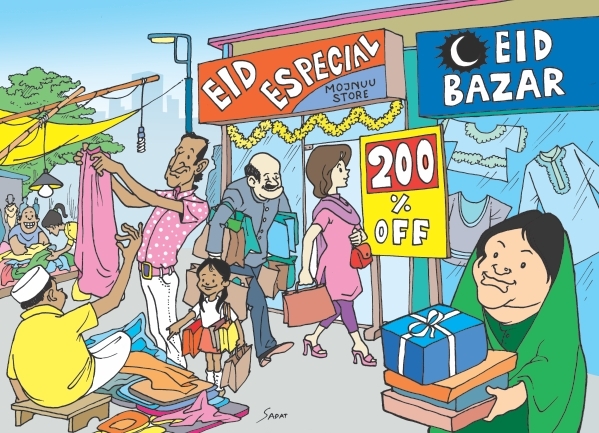 The side effects of this unstoppable shopping spree is of course the added congestion of vehicles on the roads– just when we thought things couldn't get any worse, Eid put itself on the calendar. It has now become almost impossible to get from point A to point B without getting stuck in traffic for at least an hour. Some people think of clever ways to avoid traffic when they go on their shopping excursions. “I try to leave the house right after iftar, around 7pm when the roads are relatively empty,” says Riffat Hossain. Unfortunately for her, half of the city seems to have had the same bright idea. There really is, no avoiding traffic during this time of the year. Clothes, shoes and jewellery aren't the only items in demand this Eid. Rashed and her husband will also be buying new toys for their son, nieces and nephews. Small tokens such as decorations, toys, perfumes and other mixed goodies are also being swept off the shelves by the enthusiastic shoppers. Along with regular shopping malls, exhibitions and sales for designer wear from India and Pakistan are also popular attractions during this Ramadan. Folks just can't seem to get enough. What with work, school, Iftaar parties and the shopping mania in full swing, one might wonder when we find time for anything else. Like self-restraint, prayer and charity. How many people still remember that as stipulated by Islam, they must donate to the poor as much money as they choose to spend on themselves? If we stop to think about it we'll realise that the month of Ramadan, and the Eid celebrations that follow are no longer what they used to be. Yes, people still look forward to the festivities, but the excitement is mingled with anxiety, and stress related to all the preparations that need to be made, the expectations that need to be met and the standards (set by ourselves) that need to be lived up to before that long awaited day finally arrives. And then we wonder- was it all worth it?